In 2016, the Delhi government had moved a notification banning glass coated manjha (kite string), popularly known as Chinese manjha, and in 2017, the National Green Tribunal ordered a total ban on manjha made of nylon or any synthetic material. Every August is a grim reminder of a personal tragedy for the families of Sanchi Goyal (3) and Harry (4). The two children died in separate but similar incidents on Independence Day 2016, when they were looking out of the sun roof of their family cars and had their throats slit by kite string. 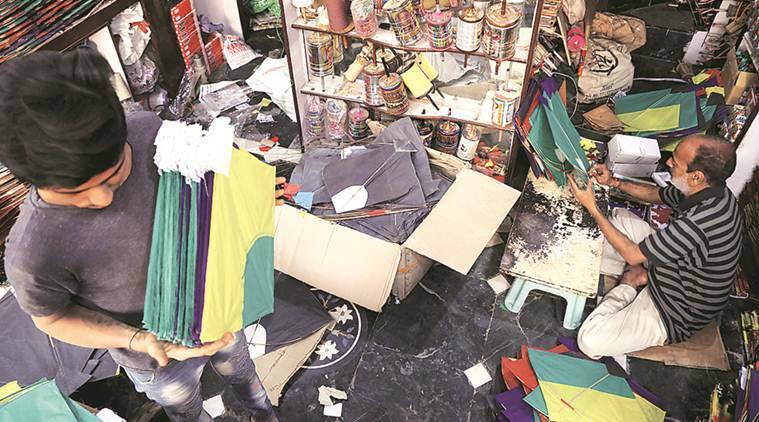 In the months that followed, the Delhi government moved a notification banning glass coated manjha (kite string), popularly known as Chinese manjha, and in 2017, the National Green Tribunal ordered a total ban on manjha made of nylon or any synthetic material. Despite the ban, earlier this month, on April 2, a stray kite sting killed a 19-year-old riding a bike in north Delhi’s Timarpur, taking the toll of manjha related deaths in the last three years to four. “Even after a ban, if a kite string kills a man, has the ban really been effective. This is off season… I really thought things would change after Sachi’s death,” said the child’s grandmother Santosh. Three years on, police have not made any arrest in the 2016 deaths. And despite the Delhi government notification asking officials to crack down on illegal manjha, enforcement on the ground leaves much to be desired. Delhi Police officers who are part of vigilance teams tasked with clamping down on Chinese manjha say there is little coordination with public health inspectors of the MCD or wildlife inspectors of the Forest Department. “We undertake our own drives. Prohibitory orders are pasted across famous wholesale markets like east Delhi’s Gandhi Nagar and old Delhi’s Lal Kuan. When we find someone selling the banned manjha, the accused is arrested under Section 188 (disobedience to order duly promulgated by public servant) of the IPC,” said an officer. As per the NGT judgment and the Delhi government notification, provisions of the Environment Protection Act, 1986 — which include imprisonment of five years or a fine of Rs 1 lakh or both — are to be invoked. Moreover, departments do not have enough staff to carry out raids, with a recent submission to the NGT by advocate Aditya Gautam revealing that the wildlife department has only two wildlife inspectors. Delhi Police maintain ‘Chinese manjha’ is a misnomer — the synthetic kite string, made of monofilament fishing line, is not produced in China but got the name because it is cheaper than traditional strings. According to a submission before the NGT, “the said line is made of a single plastic fiber and is further glass coated, which makes it deadly as monofilament is made by melting and mixing polymers, which is extruded through tiny holes, and then spun into spools of various thicknesses”. During high wind, the string is deadly enough to injure or kill birds — as well as humans. Another application with the NGT states that some of the “sampled nylon kite strings take more than 19,000 abrasions to break and the deadly nylon would not break but take the heads from the shoulders”. Traders at Lal Kuan Market maintain that ever since the ban, the synthetic manjha, mostly produced in Bareilly, Uttar Pradesh, is rarely sold in the open. “But it is sold on the internet. There are several sellers who advertise it online and give us their phone numbers. Most of the Chinese manjha is concealed in wooden spools,” said one trader, adding that it is a favourite among those who fly kites competitively. Traders also say that the glass-coated strings have given way to gum- and rice-coated ones laced with chemicals. “It may not have a glass coating but cuts just as deep,” Mohammad Nadar, the owner of a kite shop, said. During August, traders from Gujarat, Jaipur, Agra, Muradabad and Bikaner come to the capital and rent out accommodation in Lal Kuan, selling kites and strings, which are sometimes of the banned variety. This, Delhi Police say, makes it tougher to enforce rules. “The locals we can handle. But some traders from other states sell on the side and it is harder to track. Most of their buyers are professional kite fighters who buy glass-coated strings and camouflage it with a cotton string,” an officer said. Harry’s family has not celebrated Independence Day since their son died. “We stay inside our house. My wife gave birth to another son, we named him Harry. We just hope no one else has to suffer like we did,” said his father.